One thing that I have learned in my short time in graduate school so far is the importance of taking time for yourself. Here at Ohio State, football is a huge part of the culture. Three of my cohort-mates and myself bought tickets to all of the home football games. 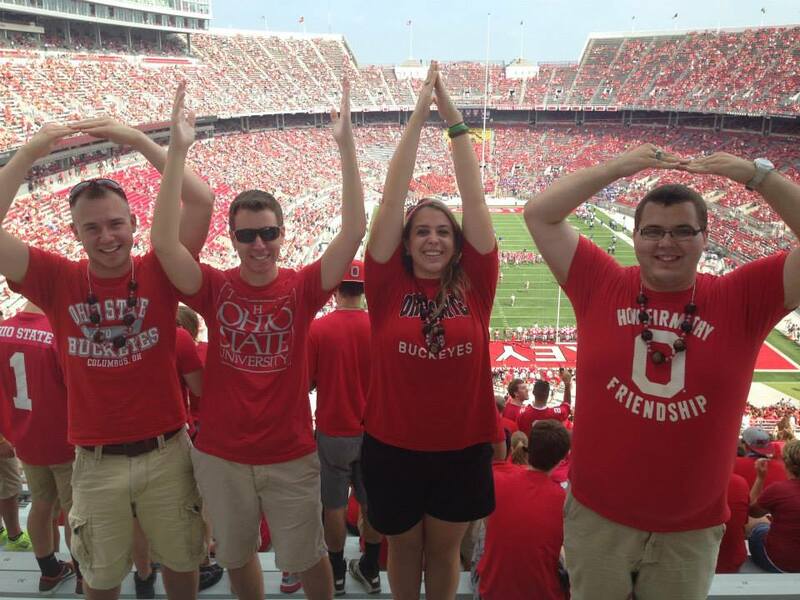 Here is a picture of the four of us doing the common “O-H-I-O” spell out at the first game of the season. If there is one thing that I’ve learned we love doing here at OSU, it is spelling the name of our state – this can be witnessed in this picture, or in the all-too-common occurrence of someone screaming “O-H” to which everyone around will respond, “I-O,” or even at the games when each side of the stadium yells a different letter “O,” “H,” “I,” and then “O.” The school spirit here is amazing and taking the time to attend a football game and not think about work or class has been life-saving! Lions! Tigers! Job Searches! Oh My! It’s Not a Diet, It’s a Lifestyle Change. Do Pageants Belong in Student Affairs? Happy Twitter Anniversary to Me! Losing Student Staff: A Blessing or a Curse?